Now we’re into Fall, it’s definitely time to start thinking about what you should be wearing in the cooler of months of the fall and winter. To give you a helping hand, the team at HKT have picked out four areas we think you should be concentrating on if you’re looking to buy a new bespoke suit or custom made blazer. And as always, feel free to get in touch with us to organise a chat with one of our style consultants to discuss what will work best for your physique, personality and needs. Book your appointment by calling us on 770-458-8682 or emailing team@hktclothiers.com. For the fall and winter months, we believe every well-dressed man should have a bespoke suit handmade from a heavier cloth such as wool, cashmere, flannel or tweed. As well as keeping you warm, a fall/winter fabric is much better at maintaining its structure than cloths suitable for warmer months. As a result, a handmade suit in a heavier fabric is excellent at retaining its shape and treating wrinkles with disdain. For fall/winter 2017, we particularly recommend choosing a winter cloth that has a lot of texture. Tactile fabrics are very much in for this season. Now, this doesn’t mean we think you should dress head-to-toe in corduroy (the big favorite of many celebrities), but you might want to think about taking a look at our range of herringbone fabrics and superb English and Scottish tweeds, which scream out to be touched. This fall/winter, a tailored suit made from a fabric that features small, subtle repeat patterns is perfect for looking your best at work and showing everyone you’re a man who keeps his eye on current trends. In particular, think about choosing a geometric cloth which features miniature checks, tiny motifs or low contrast stripes. HKT also has some exquisite cloths with narrow repeat stripes, low contrast diagonal stripes and subdued, small-scale designs which we’d love to turn into a stunning suit or handmade blazer for you. In addition, don’t forget about some of the fabrics we’ve already mentioned in the above Texture section. Traditional tweeds, flannels and herringbones are renowned for featuring small repeat patterns or subtle stripes that deliver a classic, timeless look. Choose this type of fabric for your new bespoke fall/winter suit and you’ll be on trend in terms of both texture and pattern. Yes, darks shades of blue (in particular) and gray are what to go for if you like the idea of a tailored business suit which features micro patterns, small-scale motifs or low-contrast stripes. But we’d also like to open your eyes to some colors for this fall and winter which will make you stand out from the pack: moss green, camel and orange. Colour in tailoring is certainly becoming more popular, and is part of a wider rebellion against dressing norms for men. Of course, a suit in moss green, camel or orange may not be right for your typical working day, but you could think about having a blazer made in one of these colors or accessorize a darker suit with splashes of these shades. Or why not book an appointment with one of HKT’s style consultants and we’ll talk you through which richer colors will work best for your complexion and personality? DARKER GREENS SUCH AS MOSS GREEN WORK EXTREMELY WELL IN TAILORING AND ARE MUCH MORE DARING THAN THE USUAL SUSPECTS OF BLACK, GRAY AND NAVY. MOSS GREEN IS ALSO A COLOR THAT LOOKS REALLY SMART AND IS EASY FOR MOST PEOPLE TO WEAR, BECAUSE IT WORKS BRILLIANTLY WITH ALL SKIN TONES. If you don’t fancy a full bespoke suit in this color, consider having a made in one of our premium moss green fabrics. We promise that it will look fantastic paired with some black tailored trousers or jeans. Camel is a color that’s traditionally limited to outerwear such as a long wool overcoat. But this fall and winter, it’s totally acceptable to wear this color from head-to-toe. A camel-colored bespoke flannel suit matched with a white or cream custom mock/polo neck or pale blue tailored shirt exudes über coolness. Or if a made-to-measure suit in camel is too much for you, why not get amade in this fantastic color? This would be a great addition to any man’s wardrobe and offer a completely different look to more traditional sports jackets. Okay, we don’t really expect you to walk the streets of Atlanta or your hometown in an orange suit. 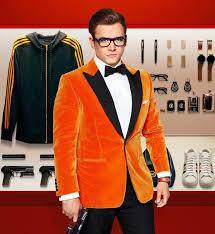 Although we did recently fall in love with a stunning orange blazer worn by Taron Egerton in the film Kingsman: The Golden Circle (more of him later). This is certainly something we could recreate for you in orange or another strong color, if you’re looking for something bold for the party season. But, really, the best way to use bright orange this fall/winter is by combining it with some of your black, navy or gray staples. An orange tie, T-shirt or shirt, or bright orange lining for a new tailored suit, will add a fabulous pop of color that will take your outfit to another level. Ask anybody who works in men’s fashion what the best dressed film is this season and they’re more than likely to say Kingsman: The Golden Circle. The outfits worn by the British spies played by Taron Egerton and Colin Firth are absolutely stunning and pure Savile Row. They project a suaveness and refinement that no off-the-peg suit ever could, and we love the fact that so many of the suits are double breasted. So if you want to exude sophistication and create a classic look that will serve you well this fall and winter, and for many years to come, speak to us about having a Savile Row inspired suit made for you. We can also talk you through the high-quality white shirts and striped dark ties we have in stock (or can source) which will complete your look perfectly. Also, for more info about the Savile Row suiting featured in Kingsman: The Golden Circle, take a look at this Vanity Fair article about the film’s costume designer, Arianne Phillips. It’s worth a read. Right, there you have it. The four areas we think you should be concentrating on if you’re aiming to impress this fall and winter. Something one of our style consultants would be more than happy to discuss with you at our store in Atlanta. Simply call 770-458-8682 or email team@hktclothiers.com to book an appointment with one of them.